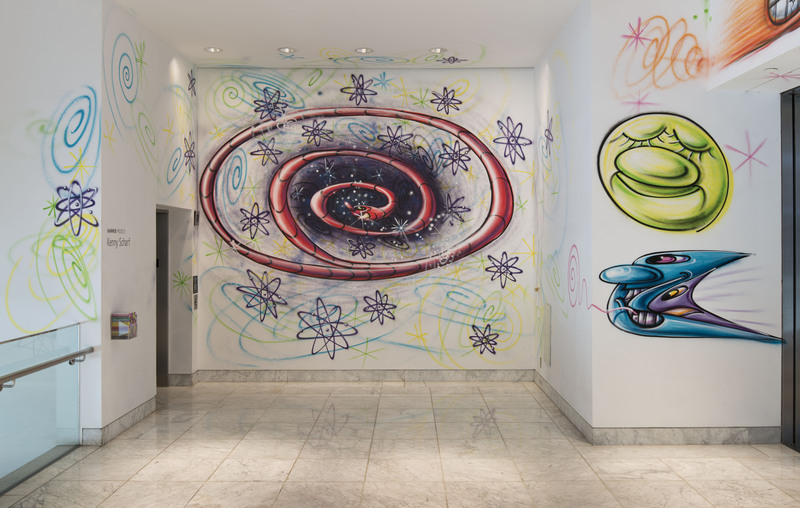 Kenny Scharf came to prominence in the early 1980s as a New York street artist, and over the years, his interdisciplinary practice has comprised clothing design, sculpture, installations, and video as well as painting—on walls and on canvas. Aspiring to reach a broad audience, Scharf has not shied away from commercial collaborations and merchandising, and working in the public realm has also expanded his reach as an artist. 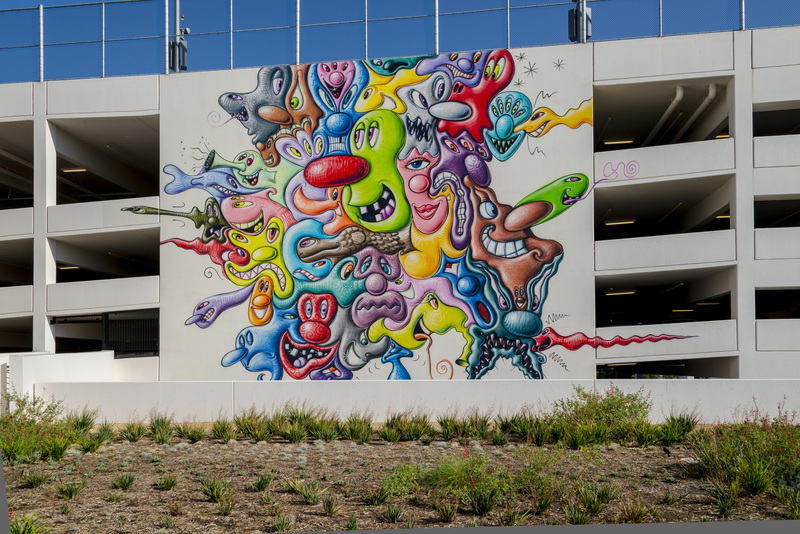 Improvised on the spot, his public murals convey a frenetic energy, reflecting his fast-paced production process, which stems from his early, unsanctioned work and the need to move quickly before being caught by the police. Even in a museum or gallery setting, Scharf stays true to those roots, retaining that sense of spontaneity in his work. 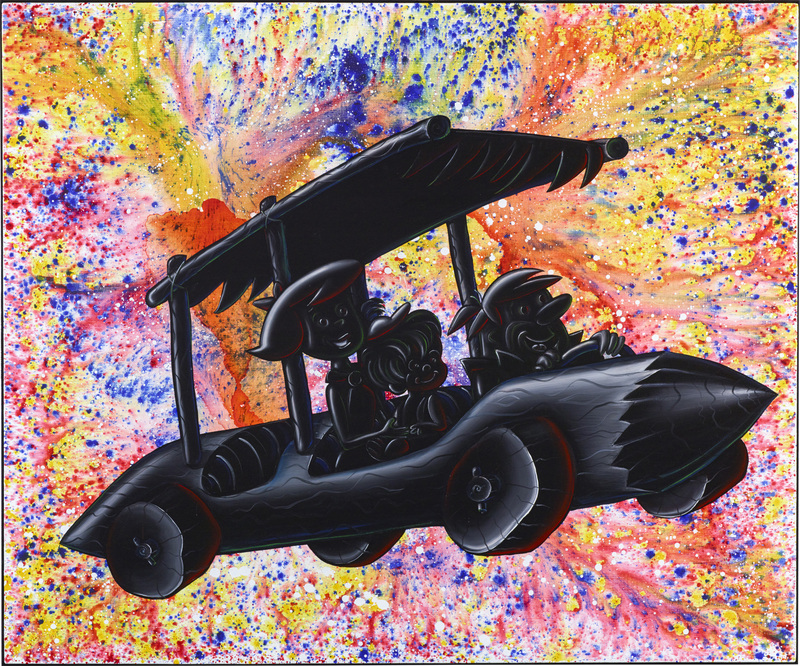 As part of the first generation to grow up with television, Scharf is interested in the immediacy of popular imagery, particularly cartoon characters. These familiar, almost universally understood figures convey complex emotions through simple means and can suggest movement even in static images. Drawing on American cartoons from the 1960s like The Jetsons and The Flintstones as well as the work of fine artists such as Yves Tanguy, Scharf has developed a cast of original cartoon characters that recur in his work. Incorporating vivid colors, he employs the expressive faces and inherent energy of his characters to effectively communicate with viewers. 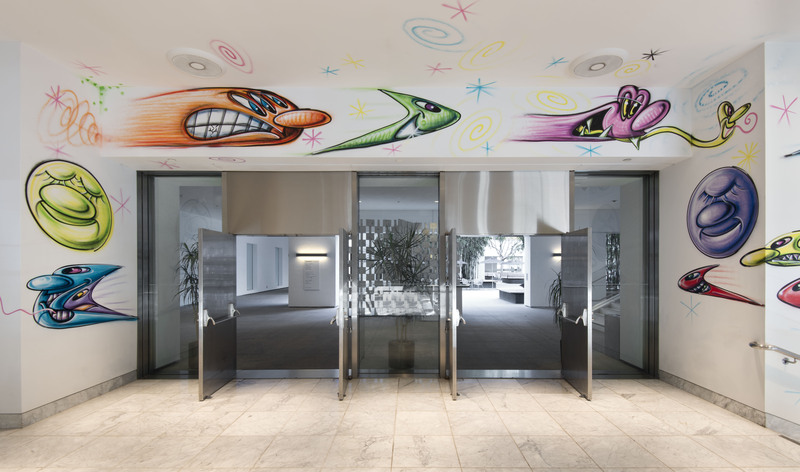 Hammer Projects: Kenny Scharf is organized by curator Ali Subotnick with Emily Gonzalez-Jarrett, curatorial associate. 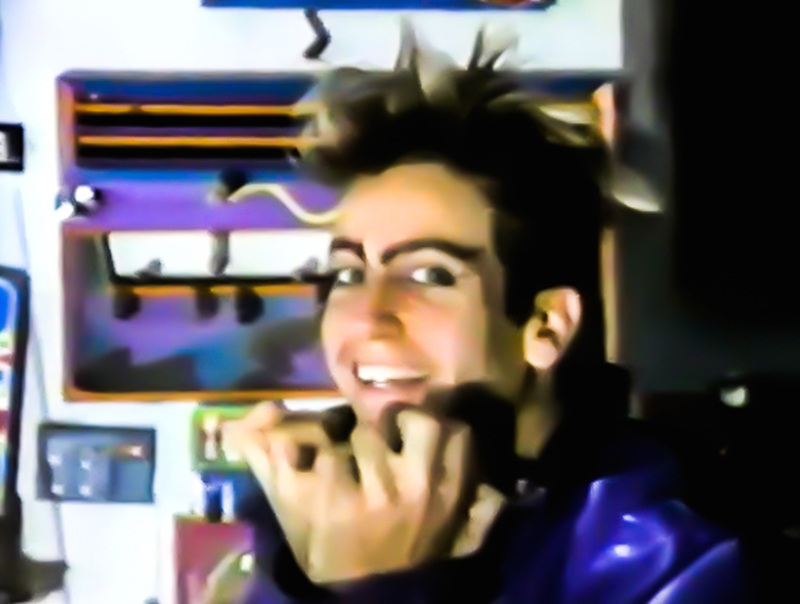 Kenny Scharf (b. 1958 in Los Angeles) received a BFA from the School of the Visual Arts, New York. His work has been included in numerous group exhibitions and he has had solo exhibitions at Pasadena Museum of California Art (2004); Los Angeles Contemporary Exhibitions, Los Angeles (2001); Portland Institute for Contemporary Art (1999); The Dali Museum, St. Petersburg, Florida (1997); University Galleries of Illinois State University, Normal, Illinois (1997); Museo de Arte Contemporaneo de Monterrey, Monterrey, Mexico (1996); and Museum of Art, Fort Lauderdale, Florida (1995). His outdoor work can be seen at Art Center College of Design, Pasadena, California; Davis Bro’s Tires, Culver City, California; West Adams Boulevard and La Brea Avenue, Los Angeles; and Pasadena Museum of California Art; among other locations around the world. He has an upcoming solo exhibition at the Nassau County Museum of Art in Roslyn, New York. Emily Gonzalez-Jarrett: Let’s start with the intuitive nature of your practice. How does that begin? 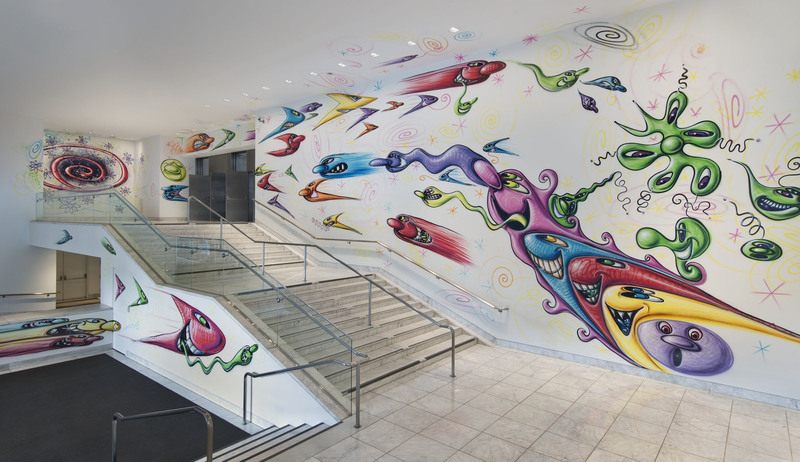 Kenny Scharf: When I approach a mural, the hardest moment, where there is tension, is the first mark because that sets the whole thing in motion. I made up a term for it, formulaic spontaneity. I am using spontaneity and not actually planning and drawing beforehand. I have an arsenal of images, yet I’d like to let the unknown guide me. It gives me a lot of excitement. There’s nothing like the energy. When I make a line or an image in that way, not only is it more exciting to do, but I think it is also more exciting to look at because the spontaneous energy translates to the viewer. Sometimes I call it magic because what I’m doing is allowing unknown factors outside myself to influence me. Something as simple as “OK, I’m going to start. What do I do?” And I’ll look up and I’ll see a bird or something, and I’m like, “OK, I’ll do a bird.” And that is how it starts. It is almost like the way jazz musicians know how to play their instruments. They’re playing jazz, so it’s kind of a free-flowing, spontaneous thing, yet they have the knowledge of how to play the instrument. EGJ: Do you think that sort of spontaneity also comes out of the fact that you began working illegally in the streets? KS: I had to make it up on the spot. That’s part of it, the whole energy and excitement. A lot of times when graffiti or street art, whatever you want to call it, gets translated into a gallery or a museum, it loses some of its urgency, which is such an incredible energy. It’s important to me to keep that spirit. And the excitement and the spirit and the energy of making things up on the spot force you to use another part of your brain. To surrender to things outside of yourself and let other things guide you. EGJ: Your library of imagery comes out of Hanna-Barbera cartoons from the 1960s, but what else were you pulling from to create these images? Where did the blob-like figures come from? KS: The Chunk Packs, which are the puzzle faces put together, are emotions. So each one is representing an emotion, whether through the color or through the expression. What I most respond to in other people’s art is when I can feel the emotion. I like to convey real emotion, and there is nothing like the cartoon for conveying emotions. Sometimes a little image can say so much more than words, so in a way they’re emojis. I was also influenced by the surrealists, especially Yves Tanguy. When I first saw his paintings—I think it was at MoMA many years ago—the forms in the landscapes connected with me at a very deep level. I love to see something that looks real and that you can touch and feel yet is completely from the imagination. To be able to actually show it is so much better than trying to explain a vision! EGJ: Since you began working in the streets, you have been pushing against conventions, but you did go to art school. What did you take away from that? KS: One of the things about art, for me, is a spirit of rebellion. I remember in art school the teacher told me, “You can’t paint this color.” Who said? Who wrote these rules? I think the thing that is so exciting about art is that it allows the individual to have complete freedom. You can do anything, anything at all. So why would you want to go by the rules? Rules were meant to be broken, especially in art. How has anything in the name of art ever happened that was truly exciting? Well, when it was breaking with some other idea of what it should or shouldn’t be. So that’s what gets me excited. I want to keep going and breaking boundaries and going places that I’ve never been. And places that no one else has been. It’s my nature. EGJ: It’s interesting that the things you did when you were younger that were transgressive, that were against the law, have become a school in itself, an art tradition that people have adopted. But for the most part they are following suit; they are not really breaking the mold or improving on it. KS: Yeah, because there is a new mold. EGJ: I think you are right that everything interesting is a reaction to something else and it’s part of this ongoing conversation of art. At this point in your career, you are famous because of your working in the streets, merchandising, and fashion collaborations. You have become part of a canon. How do you see that? KS: The really important thing for me is communicating, and the bigger the audience, the better. I wanted to widen my audience. I went to art school, took art history, and I want the art elite to be able to see in my work how it’s new but also how it has a tradition within it. I also want people who don’t know or care about art to want to know about art and get inspired in some way. EGJ: Street art has become an offshoot of what is considered high art, but it is all part of a larger conversation. Some younger artists working in the tradition may think they don’t have to visit museums because museums are not paying attention to them, that they are part of a different conversation. I think it is important not to operate in that sort of bubble. KS: Of course I’ve talked to younger artists and looked at their work. They want me to talk about their work, so I ask if they know so-and-so. “No.” “Well, maybe you should.” “No, I don’t want to. I don’t want to be influenced.” Well, don’t you think you should know if what you are doing looks so much like someone else’s work from twenty years ago? And if you did know about it, maybe you would learn something new about what you are doing. Any time someone closes their mind, they are doing a disservice to themselves. I remember back in the early days, when graffiti artists started showing in galleries, the work that they had been doing on the streets, they were now doing on canvas, and it lost something. I said, “Well, now that you want to be in this world of art, you need to study art.” You need to know what you are getting yourself into. It is of the utmost importance. Knowledge is power; you can never have too much. EGJ: It goes the other way as well. There was a time when pop culture was not a part of fine art. Now music, television, film, have seeped into the fine arts because we acknowledge that we have these other interests. KS: A lot of my work comes from inside me. It wasn’t really my choice when I was a child to be bombarded with all this imagery, but I was, and I soaked it up. It’s inside me, so when I’m drawing from inside, often it will be pop culture based. And it’s a different way of going about how the early pop artists looked at the world. They took things off the shelf and looked at them in another way. I’m into that, but what I’m doing is more akin to the surrealists in that I’m drawing from my subconscious. It’s just that my subconscious is filled with popular imagery. So it’s very weird and interesting that something that is recognizable to everyone—everyone knows Fred Flintstone, for example—is a personal thing for me. So something that is very personal for one person can also be personal for others because of the world that we live in today. This exhibition is presented in memory of Tom Slaughter, and with support from the Horace W. Goldsmith Foundation. Hammer Projects is made possible by a gift from Hope Warschaw and John Law. Generous support is also provided by Susan Bay Nimoy and Leonard Nimoy and Robert Soros. Additional support is provided by Good Works Foundation and Laura Donnelley.